At best, a mosquito bite is an itchy annoyance. 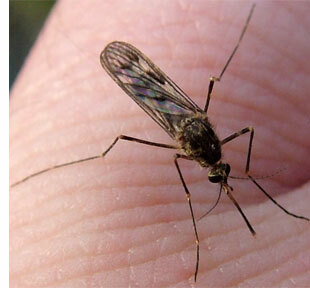 At worst, it can kill you (via malaria or any number of unpleasant inflections). In either case, being bit by a mosquito is sub-optimal. When in a mosquito-infected area the single easiest preventive measure you can take—so easy that no spray, lotion or net is required—is this: wear Insect Shield clothing. Insect Shield is a technology that involves weaving a repellent into fabric. The repellent Insect Shield uses, permethrin, is found in several species of plants (that also use it to keep insects away). The great thing about permethrin—besides the fact that it naturally occurring—is that it is durable and binds tightly to fabric. While inspect spray lasts for a few hours (at most), permethrin has a very long half life. The result is that Insect Shield clothing retains its repellent qualities for years, even through regular washings. Another cool features of the Insect Shield’s permethrin repellent: It is completely odorless. And it repels a variety of undesirable little critters, including ticks, fleas and flies as well as mosquitoes. Spot Cool Stuff tested out Insect Shield Clothing on tropical trips to Thailand and Laos, to Tanzania and to Jamaica. Not once did we get bit under an Insect Shield garment and only once were we bit close to it. The problem is that the insect “shield” seems to only extend a few inches from the treated fabric. And you are unlikely to have the entirety of your body covered in Insect Repellent clothing, not unless you happen to be wearing an Insect Shield speed skating suit. 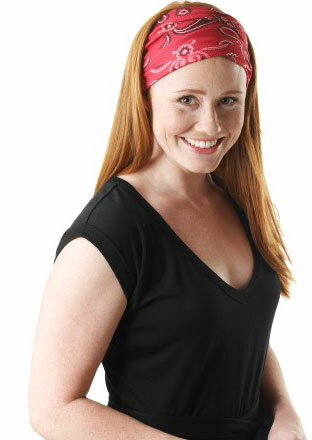 Wear a short sleeve Insect Shield shirt and you’ll be bit on your forearms. Wear an Insect Shield hat and you’ll get bit on your neck. And so on. This vulnerability doesn’t render Insect Shield clothing worthless. The clothing’s anti-insect properties are certainly a significant upgrade to no protection at all. Particularly effective is the combination of long Insect Shield pants together with Insect Shield socks—that can keep the whole of one’s lower half mosquito bite free. However, it does mean that if you are heading into an especially mosquito-infected area you’d be wise to combine Insect Shield clothing with a good insect repellent spray. Your basic tee might be the most useful Insect Shield garment there is. These shirts can be worn while sleeping (important since malarial infected mosquitoes bite almost exclusively between dusk and dawn). 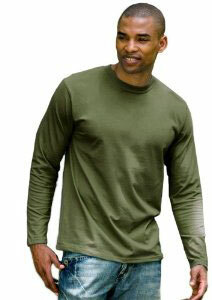 Tee shirts also cling a little more tightly to the skin making it harder for insects to crawl underneath. There are a variety of manufactures who make Insect Shield tee shirts, Zorrell and ExOfficio being our favorite among them. Insect Shield tees come in both long and short sleeves. 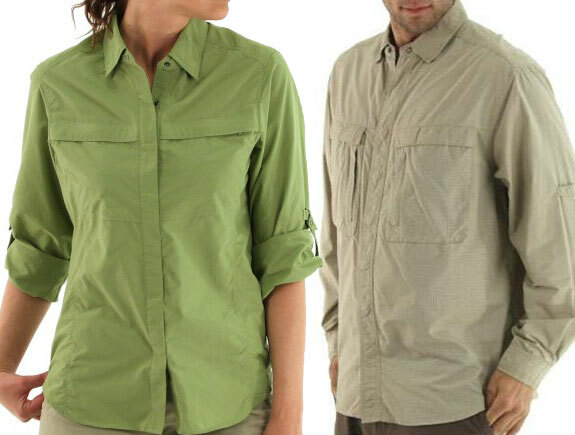 Button-down collared Insect Shield shirts come in a variety of colors and styles in both women’s and men’s designs. Most are full of pockets, which is practical for travel but not exactly the fashion you’d want if attending an outdoor soiree. 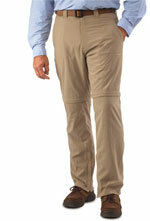 Our favorite Insect Shield button-down is the ExOfficio Baja; it is soft, breathable and includes 30 SPF sun protection. The Insect Shield polo shirts aren’t travely but they are perfect for attending a picnic or some other informal outdoor function. Unfortunately there are only three colors to choose from—and two are shades of blue. 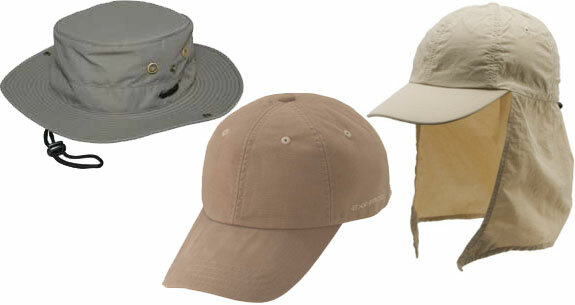 Insect Shield headwear does almost nothing to protect you from mosquitoes. These hats don’t shield your neck (see “So, does it work?” above) and mosquitoes almost never bite over hair. (And, even if you are bald, the top of a head doesn’t have much in terms of veins). However, an Insect Shield hat is highly effective at keeping away tics. Pants with Insect Shield range from the absolutely hideous, bright lime GloWear Two-Tones to the more classy ExOfficio Altyn Pant (for men) and Trailhead Roll and Cinch (for women). Personally, Spot Cool Stuff is not a fan of trousers that convert to shorts with zip-off legs though there are several of these types to choose from. Other Insect Shield items include bandana and socks.  The ideal insect repellent contains between 20% and 40% DEET. Less than 20% DEET and the repellent isn’t effective as it could be. 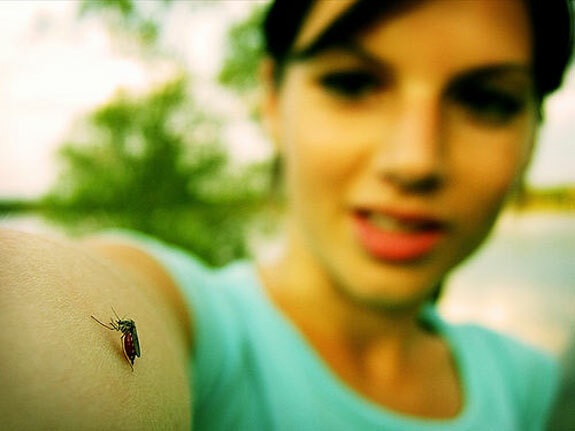 Going over 40% DEET will not increase repellent qualities but will harm your skin and eat through your clothes. Spot Cool Stuff suggests the Ben’s 30 line of sprays and wipes. How you can go to the manufacturer and find out about prices and availability. There are interested people! As with all SCS posts, you can click on the LEARN MORE link to, well, learn more. In this particular post you can also click on the clothing item you are interested in. 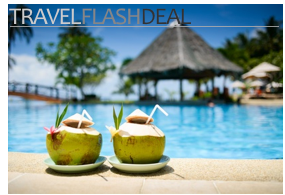 Prices vary depending upon what exactly you are looking for.